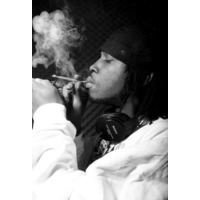 Jerold Dwight Ellis, III, (born October 18, 1974 in Oakland, California) better known by his stage names Yukmouth & Yuk, is an Grammy-nominated American rapper from East Oakland, Oakland, California. He is the founder of The Regime, Smoke-A-Lot Records and Godzilla Entertainment. He is a member of the platinum-selling rap duo Luniz along with Numskull. Luniz recorded the successful weed anthem, "I Got 5 on It". He went on to sign a solo record deal at J-Prince's Rap-a-Lot Records, releasing four albums. His double album debut on the label, entitled Thugged Out: The Albulation went gold. Under his own label, Smoke-a-Lot Records, he has released DVD's and compilation albums, such as the United Ghettos of America series. He is a member of Thug Lordz, with C-Bo and Spice 1. He is known in the rap industry for both his remarkable history of collaborations and his ruthless diss tracks.